Bowfishing is a very fun sport, and in a long term survival scenario, is a great alternative method of catching large fish in shallow water year round. Watch the amazing videos to see for yourself! This model is very easy to convert to a traditional compound bow. The Precision Shooting Equipment Discovery Bowfishing Bow Pack is a very nice package deal for a bowfishing set that includes the PSE Discovery bow, an AMS reel, two arrows and a snap shot rest. If you live in an area where you have Lakes, Rivers and ponds with shore or boat access, or marshes for wading, you most likely have candidate locations that would be great for bowfishing. Bowfishing is legal in almost any water where rod and reel fishing is legal. Good shooting can be found anywhere from small streams to large reservoirs. Great bowfishing can be found all over the United States. Check your state's laws on Bowfishing to see which fish are allowed to be hunted. Typically, game fish are not allowed to be taken by bowfishing. Non-game fish (also known as "Rough fish") are typically allowed for bowfishing. Rough freshwater fish (defined by each state's laws on bowfishing) can include carp, eels, suckers, buffalo, perch, catfish and gars. Saltwater fish can include Bowfin (some call them dogfish), sharks and stingrays. In some states, you can even hunt alligators by bowfishing. Even if the fish that you are hunting aren't biting for normal fishing, if you can see them, you can shoot them. For big game bowfishing, you can also hunt Gator Gar, Sharks, Stingrays, and Alligators. See the additional readings below for more details. Know the bowfishing laws for your state. The type of fish that you can hunt legally is regulated by individual states, so check local regulations with the department of natural resources or fish and wildlife where you'll be bowfishing. Also learn about safety for you and others around you before bowfishing. Use arrow points with retractable barbs for easier fish removal. Learn and practice the the 10-4 Rule. If a fish is ten feet away and one foot under the surface, aim four inches low. As you double either the ten or the one, double the four inches accordingly. You’ll be surprised at how quickly it becomes second nature with practice. The following YouTube Videos are demonstrations of bowfishing and how easy and how much fun it can be. Note: The very first video shows a lot of bowfishing from shore. You can see from this video how bowfishing could be an easy way to provide food in a Doomsday survival scenario. If you have never seen aerial bowfishing for carp on the Illinois River, watch the last two YouTube videos for the entertainment factor. "Great bow . Smooth draw." "Awesome graphics, great performance, superior quality." "Awesome product and had fast delivery! Bow fishing with this bad boy is so so easy absolutely love it highly highly recommend this bow!" "Great deal. Great Setup for Bowfishing the bow shoots great and looks great. Alongside with the ams reel, two arrows and the snap shot rest this is a must have package deal." "Great bow. I was concerned that 40 pounds would not be enough but has plenty of power. Has a lot more power than my 40 pound recurve any my old 55lb compound. Wish it had a longer draw length i need a 32". Very light weight. 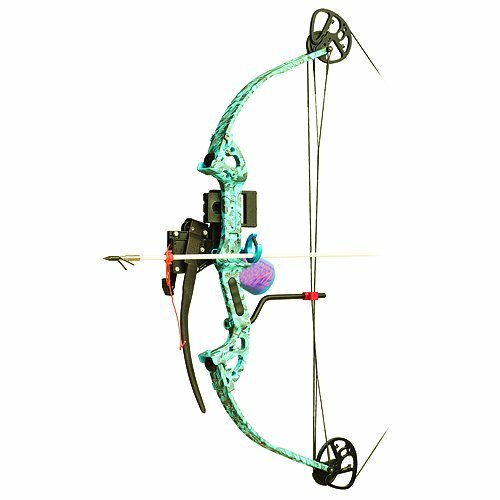 Would definitely recommend this package....There are other bows that cost more but i don't see how they could possibly be any better." Use at your own risk. Please note that the information provided on this web page is for information only. TopSurvivalPreps.com and it's owner have no liability or responsibility for anyone using any items described on this web site including the Precision Shooting Equipment Discovery Bowfishing Bow Pack and accessories. This bow is extremely LETHAL.